Our featured adoptable animal of the month is Luna! 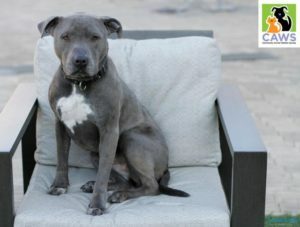 Luna is a 3 year old beautiful Blue Pit bull. She is a total people dog and loves kids! She will need to be an only pet, because she has so much love to give her people! She does not like cats or other dogs. Luna is currently being fostered by the trainer and owner of The Loyal Canine Inc. She has been working on socialization, manners on leash, crate training, walks on the treadmill, and basic obedience and is doing great! Luna is a pretty lazy gal and loves squishy dog beds. She has her puppy like moments as well and loves to play and roll around on the grass. Luna has severe allergies that were not previously taken care of. We now are working through them but it will be an on going process and she is on a strict diet. Luna is looking for a family who will give her the attention she deserves. Someone patient, a good leader, and is willing to work on her allergies. She is worth it!! She loves her people and really wants to please. She loves walks and going out and about with you to explore the world. She is spayed, up to date on vaccinations, and microchipped. Included in her adoption fee is her free initial go home training to make sure she gets off to the right start in her forever home. Animals are not placed on a first come, first serve basis. CAWS strives to find the perfect match for all of our animals. Visit caws.org to find out more information or complete an adoption application for Luna!